Few jobs in this world are more challenging or more rewarding than teaching, so why not reward that special teacher in your life with fresh flowers. Whether they’ve made a lasting impact on the learning of your child or helped you as a student through a tough semester, a vase full of irises is the perfect way to thank a teacher who has gone the extra mile to make your life, and your community, a little bit better. Named after the Greek goddess, Iris, who carried messages from Olympus to the Earth along the arc of a rainbow, this flower signifies the connection between wisdom and hope- both of which are traits absolutely necessary to make it as a teacher. Iris was seen as a messenger between the heavens and the earth and is symbolic of wisdom and valor in the language of flowers. A tall, straight-stemmed perennial, iris make up a genus of well over 200 different species. There are three main varieties available through a florist; bearded iris, Dutch iris and Siberian iris. 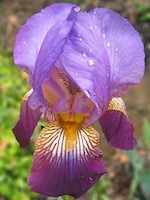 Bearded iris are the types that are typically grown in landscapes and feature heavily in art. They are late spring to early summer bloomers and have large flowers with three upright and three drooping petals. Each bloom can be over 6 inches tall and half as wide. They get the name “bearded” from the tufted fuzz on the inside of one of the lower petals. Flowers come in purples, reds, yellows, whites- any color of the rainbow, really. The graceful look and absolutely mesmerizing scent of these iris make them a lovely gift that can be picked from your own yard in May, which is perfect for the end of the school year. Growing bearded iris is extremely easy, as they can be planted from a rhizome (a thickened, underground stem) that has been divided from a larger clump of irises or purchased at a garden center in the fall similar to tulips. Most florists will have them in stock from April-June, but expect to pay about $3 a stem. For a slightly more economical choice that is available year-round, consider the Dutch iris. These slightly smaller irises come in different shades of purple and usually have a bit of yellow in the center. Opening up slowly over the course of a week, these 1-2 foot tall stems will brighten up a classroom for only around $2 each and look amazing mixed in with a bit of alstroemeria or asters. A teacher’s job is filled with many thankless tasks, so send them your thanks with fresh irises and let them know they’re an A+ in your book!